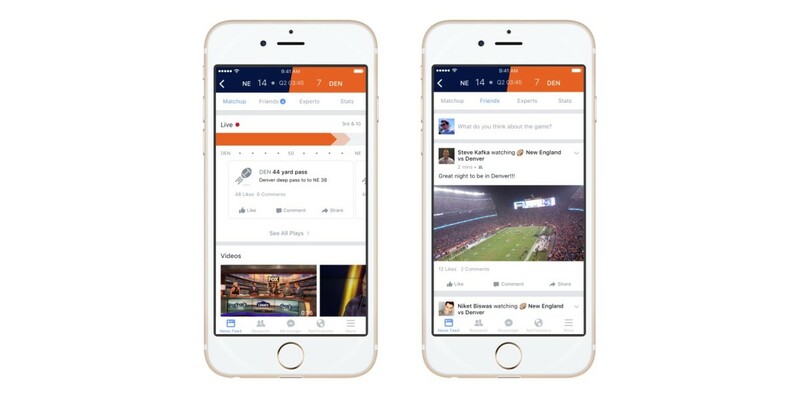 Facebook has launched Sports Stadium, a new feature that pulls in live sports scores and play-by-play updates, game info as well as posts and comments from your friends and experts. The social network will now display updates and stats in real time and allow you to comment and share these individually with your buddies. The company says it hopes this will serve as a second-screen experience to make it even more fun to watch games on TV, but it could also help keep you updated when you’re not in front of a big screen. Right now, there’s only one way to access Facebook Sports: by searching for the game in the app. The company says it will soon introduce new ways to find the feature. The launch of Facebook Sports will no doubt aid market research firm Nielsen’s efforts to incorporate conversations about TV programming from social networks. It began culling comments about shows from Twitter in October 2013 and announced yesterday that it would begin monitoring public posts and comments on Facebook to round out its TV ratings service. Last October, Facebook began testing live sports updates in Messenger conversations. It allowed some users to subscribe to MLB World Series news, scores and highlights right within a one-on-one chat with a friend. The company is rolling out Facebook Sports today for American football games on iOS in the US. It told Recode that the feature will come to Android in a “matter of weeks” and arrive on desktop for the Super Bowl. Support for other sports around the world like basketball and soccer are on the cards as well.